“No other medical development has been as successful as vaccination in controlling deadly diseases in companion animals,” says feline veterinarian Dr. Arnold Plotnick. Dr. Plotnick and other veterinarians acknowledge that, rarely, vaccinations in cats have been linked to the development of fibrosarcoma, a type of cancer that may occur at the site of injection. Studies of these sarcomas say the prevalence ranges from one in 3,000 to 10,000 cats. Many groups are intensely studying this problem, including immunologists, vaccine manufacturers, and the American Association of Feline Practitioners. The Vaccine Associated Feline Sarcoma Task Force has studied many factors: type of vaccine, location of vaccine, additives to the vaccine, and genetics of the cats. The most recent study was published in the Journal of the American Veterinary Medical Association. This showed that the safest injectable vaccines were recombinant vaccines. These have newer technology and are much more purified. This paper also demonstrated that the sarcoma problem can happen with other injections such as antibiotics and anti-inflammatory drugs, not just vaccinations. Do your indoor cats, which have little to no contact with other animals, even need to be vaccinated? According to Plotnick and other leading veterinarians, vaccinations are indeed essential to a pet’s well being as some infectious agents are airborne and do not need direct cat to cat exposure. “To not vaccinate our pets is not an option,” said Dr. Plotnick. Instead, veterinarians must work closely with pet owners to devise a vaccination schedule that best meets a cat's individual health needs. Vaccine manufacturers have also stopped putting aluminum salts into vaccines. 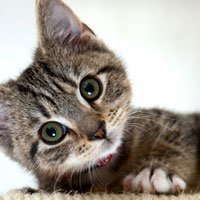 All kittens should receive a series of FVRCP core vaccinations. This immunization series begins at six to eight weeks of age and continues every three to four weeks until the kitten is 16-18 weeks old. The rabies vaccine is usually given at the last vaccine visit. The American Association of Feline Practitioners recommends that kittens receive leukemia vaccines whether they go outside or not. If you have recently adopted a cat and do not know your cat’s immunization history, the cat will need to receive core vaccinations. A dose of the FVRCP vaccine should be given immediately and a second dose should be administered three to four weeks later. The American Association of Feline Practitioners recommends that adult cats have a FVRCP and rabies vaccinations every three years. Your veterinarian can help you decide if your cat needs any non-core vaccines. Vaccines for cats are divided into two categories: core vaccines that are essential for every cat, and non-core vaccines that may or may not be necessary based on a cat’s lifestyle. For example, vaccines against feline leukemia virus (FeLV) are non-core vaccines that may or may not be necessary based on a cat's lifestyle. For example, vaccines against feline leukemia virus (FeLV) are non-core vaccines that are generally not recommended for indoor adult cats. One core vaccine is called FVRCP, which protects against panleukopenia (feline distemper), rhino, and calici virus. The rabies vaccine is also a core vaccination. There are two types of feline rabies vaccine: a killed vaccine that can be given every three years and a recombinant vaccine that is offered by one vaccine manufacturer. The findings of the recent AVMA article suggest the recombinant rabies may be safer, but it does need to be given annually. If your cat is up to date on core vaccinations, then your cat may be able to receive boosters every three years, rather than every year. Check with your veterinarian to confirm whether your community requires annual rabies vaccination or permits the three-year vaccine. Also, ensure that your feline has a physical exam every year. JAVMA, Vol 241, No 5, September 1, 2012. Comparative vaccine- specific and other injectable- specific risks of injection site sarcomas in cats.